I heard of THE VAULT by accident. I was checking movies playing in NYC this Labor Day weekend and ran across a listing for the film at the Village East Cinema. Not knowing what it as I sent an email to Joe Bendel who has a pulse on horror releases in New York and he had no information on it either. Seeing a Tweet from Film Rise earlier today I saw that it was on VOD so I plunked down my 7 bucks and gave the film a whirl. Give THE VAULT my vote for Unseen Gem of the month if not the year. How it the film has ended up buried is completely beyond me since its a tense little thriller from the first frame. It is light years better than most similar films and it's dumping means that people are not going to see a real gem of a film. The film starts off with a bang as to sisters take part in a robbing a bank to help their brother who is in deep debt to some bad guys. Things escalate fast and soon there is a hostage situation. orse the promise half million dollars is only seventy grand. Not sure what to do, an assistant bank manager says all the money is down in the basement vault. Of course there is nothing good in the basement and it maybe something evil from the horrible events of 1982. Yes we have been here before, but frankly it doesn't matter since the film starts from the first frame and just goes straight to the end. What I love is that for most of the first half hour the film is a bank robbery film. There is only a whiff of the supernatural when the branch manager the the Francesca Eastwood character during an job interview they can't keep tellers because some feel the place is haunted. By the time the weird stuff starts we are invested in most of the characters so when bad things happen we're already all in and ready to go. And go it does, moving like the wind so that we never have a moment to breathe. It's only about 70 minutes in when we see the remnants of something that supposedly happened elsewhere that the film stubs it's toe. Its a momentary lapse and the film quickly recovers. Not to put too fine a point on it- this is a super film with real tension (even the bright daylight). Highly recommended. 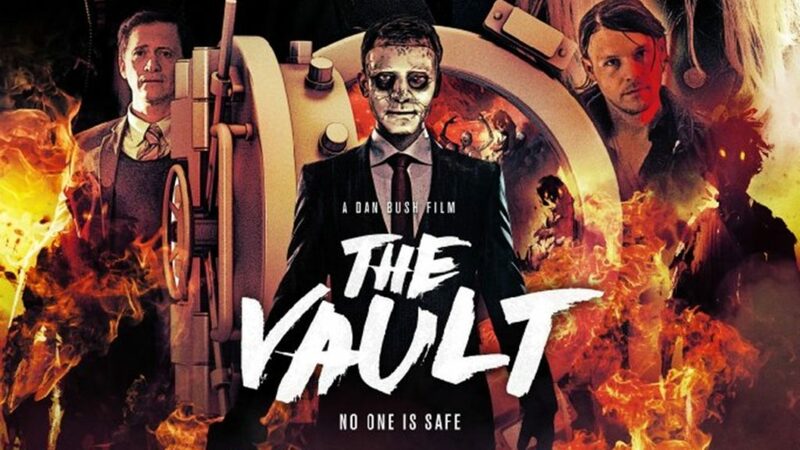 THE VAULT is currently in a select theaters and is on VOD in the US and I believe it hits theaters in the UK Friday. Addendum: James Franco is perfect in his role.